Following in the footsteps of the last entry, Burt Lancaster Goes to War! This second set of films has Lancaster delivering very measured performances, although unlike his underplayed performances in Judgment at Nuremberg (1961) and The Train (1964), he’s very clearly the star. 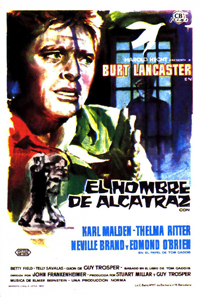 John Frankenheimer’s 1962 film of Thomas Gaddis book Birdman of Alcatraz has Lancaster’s size and screen presence creating tension and contrast as the actor plays Robert Stroud, a felon convicted of two murders who became renowned for his work on avian diseases. 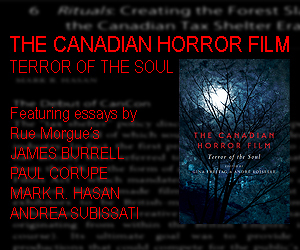 It’s very much a humanistic tale of redemption, but there are shades of grey than infer the filmic Stroud, like the real Stroud, was kept locked up because of a potential for violence. Other circumstances minimized (or outright killed) his chances for release, and it’s a potent film that still has the power to force viewers to shift positions throughout its narrative. Twilight Time’s Blu-ray features a nice transfer with an isolated track of Elmer Bernstein’s tender score, plus a really thorough commentary track by the TT team. Producer / co-commentator / moderator Nick Redman could probably do commentaries in his sleep, but he’s consistently delighted by the process of discussing and recording a film’s history to ensure it’s context in the careers of its makers and its respective genre aren’t forgotten. 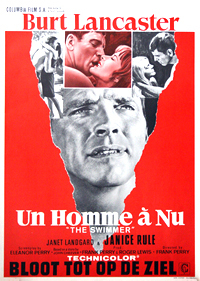 “A man is naked!” (aka ‘The Swimmer’) says the poster. Paired with Birdman is Frank and Eleanor Perry’s adaptation of John CHeever’s The Swimmer (1968), which Grindhouse Releasing showcased in a near-perfect, ridiculously (that means good) exhaustive special edition. A challenge facing any label and home video producer is how to craft contextual special and value-added special features when so many of its cast & crew have passed on. Grindhouse got lucky in getting several who are still with us (including composer Marvin Hamlisch, shortly before his death), but my point is that it is possible to create extra features with even a smattering of production personnel, research, and / or historians, rather than put out a bare bones disc. Fans of the film will adore the extras, but the transfer is really the draw – The Swimmer’s never looked and sounded better, and Sony’s HD department is clearly doing a great job in porting over their deep catalogue titles for licensing. 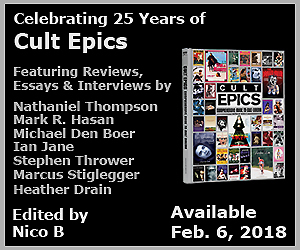 Where Grindhouse’s brilliance comes in is to recognize a unique title and release a special edition to end all special editions – not a split run with bare bones and a separate loaded edition. I can’t imagine a dual run works in the current market, especially since Criterion dumped their Essential Art House line when it was clear collectors want a singular definitive release. Coming next: Jon Stewart’s very flawed Rosewater (Elevation Pictures).